Saudi embassy certificate attestation is mandatory to prove the authenticity of the documents provided by you to the authorities. These documents have to be attested strictly according to the guidelines provided by Saudi embassy. When you apply for the visa of any country, it is a prerequisite to submit documents for verification. The country for which you are applying for visa needs to know the authenticity of the submitted documents; therefore, they require you to attest your documents from their respective embassies in your home country. In case of the absence of an embassy in your country, you shall approach the nearest consulate of that country. Proper embassy attestation is mandatory for getting work permits in Saudi Arabia. It is necessary to follow proper attestation procedures for all certificates. Without which, the authority will reject your application. Saudi embassy attestation is essential for getting admissions in Saudi universities and schools. State HRD (Human Resources Department): Attestation of educational certificates from the state HRD of concerned state. MEA (Ministry of External Affairs): In this second process, certificates are attested from the Ministry of External Affairs. Saudi Cultural Attestation: After MEA, the documents are verified from the Saudi Cultural Attache. 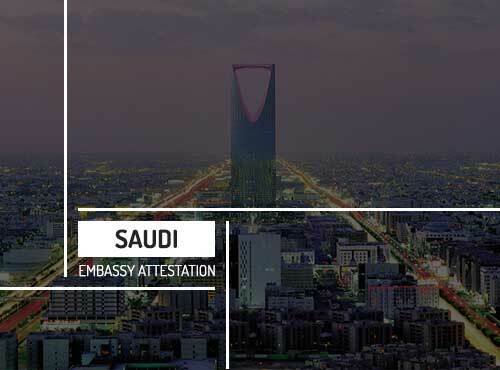 Embassy Attestation: Certificates are attested from the Saudi embassy/consulate. Urogulf is the most secure and transparent attestation services agency in India and the Middle East. Our team of experts will guide you through the documents required for Saudi embassy attestation services. The years of experience in the certificate attestation has made our experts knowledgeable in this arena and they know different ways to do the procedure within a limited time period. We guarantee thorough safety of your documents and you can get the status of the documents from anywhere through our website. The type of visa that you applied for determines what types of document are needed for attestation. For example, if you are applying for work permit in Saudi, you need to provide professional certificate for attestation. If you are applying for family visa, you need to provide the marriage certificate and birth certificate of the child. Had a good experience with urogulf. Got Bachelor Degree Certificate attested for Saudi before committed time. Really appreciate their service. Will definitely refer all.